The Ford Fusion is a midsize sedan that is equipped with fuel saving technology. The Ford & Wave feature and the EV Mode are just two of the systems. The Fusion Plug-In Hybrid with EV Mode lets you select between using plug-in power, gas, or a combination of both. To help you pick the best mode Ford created the MyFord mobile app and the My Ford Mobile website. In these sites, you can schedule and monitor your Fusion’s charge. Ford & Waze helps make your drive time as short as possible. It uses traffic apps and information gathered from crowd sourcing to keep drivers posted of traffic jams, road hazards, and accidents. The system can be accessed through mobile devices or hands free with the driver’s console. 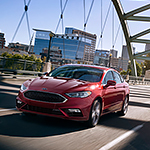 Want to take a test-drive, and see more of the Ford Fusion technology in action? Visit us at West Herr Ford of Amherst. Our team would be more than happy to set you up today.